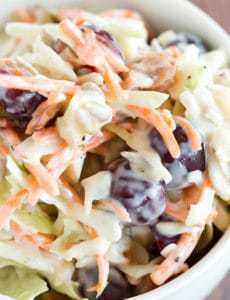 A loaded cole slaw recipe loaded with cheese, bacon, grapes, and sunflower seeds. A great addition to your summer picnic! In a large bowl, combine the coleslaw mix, cheese, bacon, sunflower seeds, grapes and black pepper. Drizzle over the coleslaw dressing and gently toss until all of the ingredients are evenly coated. Serve immediately or cover and refrigerate for up to 1 day before serving.